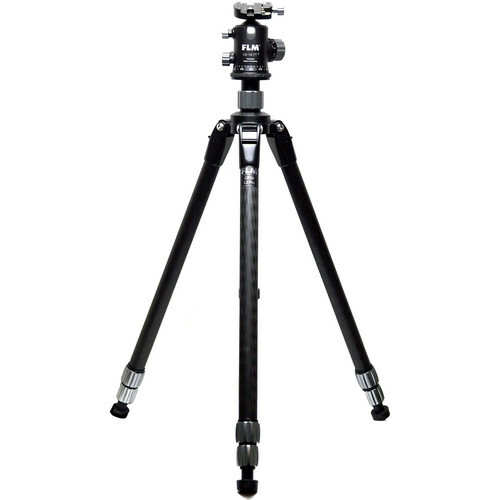 Max Height: 68.1", Min Height: 4.7"
This FLM Tripod and Ball Head Kit includes a CP30-L3 Pro Tripod that supports up to 33.1 lb, and measures 24.0" when folded. Each of its 3-section legs features an independent spread, a 3-position angle lock, and twist locks for rapid deployment. 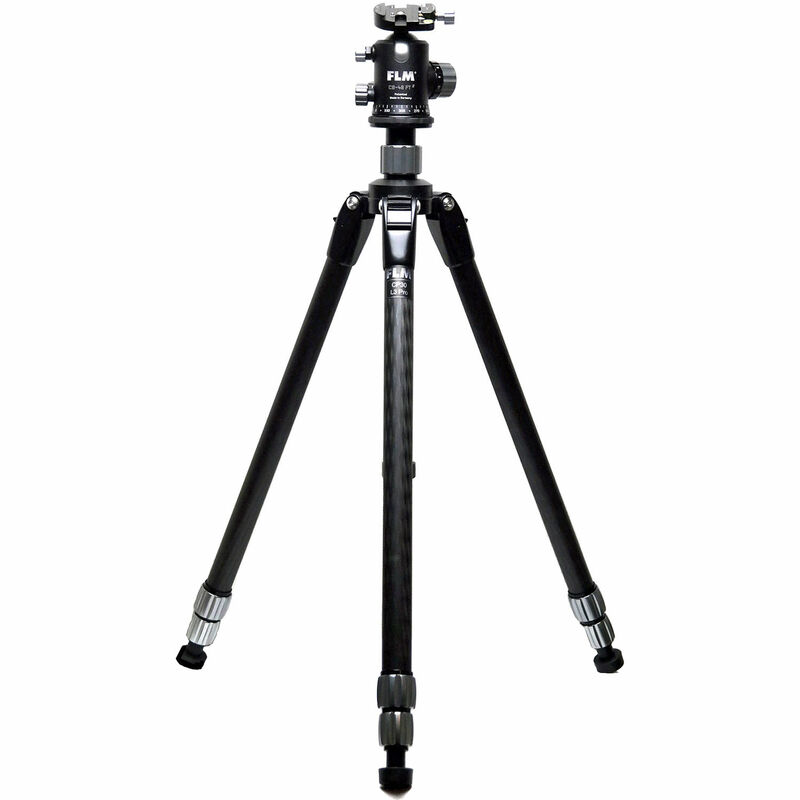 The tripod can be set at a minimum height of 25.6", or 4.7" without its removable, push-and-pull, rapid center column. Together, the three legs can be extended to obtain a maximum height of 57.1", or 68.1" when used with the center column fully raised. To further enhance stability on a wide variety of surfaces, including soft and uneven soil, each of the carbon-fiber legs includes a rubber foot with a twist-out, metal spike. Tripod heads or accessories with 1/4"-20 or 3/8"-16 female accessory threads can be directly connected to either of the included, interchangeable mounts for the center column. For added versatility, the center column itself is reversible, facilitating low-angle photography where an attached camera is positioned among the tripod's legs instead of above them. Also provided is a CB-48FTR Ball Head that can be attached to tripods or other support systems that feature a 3/8"-16 mount. Separately-available Arca-type quick release plates can be attached or removed from the integrated SRB 60 clamp located at the top of the ball-and-socket joint by tightening or loosening the clamp's knurled, locking knob. A bubble level is integrated within the locking knob's rosette. For use in the landscape orientation, an additional bubble level is included along the top surface of the clamp. Within the recessed surface between the clamp's jaws is a retaining pin. This pin prevents an installed quick release plate from accidentally sliding off when the clamp is opened. Adjacent surface grooves complement the retaining pin by improving the efficacy of retaining screws installed on the bottom of some Arca-type plates. When used, such screws can also serve to prevent the Arca-type plate from accidentally sliding off when the clamp it is placed on is opened. The CB-48FTR Ball Head has a load capacity of 99.2 lb. By loosening the ball head's primary locking knob, its ball-and-socket joint can be quickly swiveled, angled, fully tilted, or returned to its upright position. Up to twelve levels of pressure can be applied to the ball-and-socket joint's movements by rotating the numbered tension ring located around the primary locking knob. Toward the ball head's base is a secondary locking knob that controls the ability to rotate the head 360°. Near the top of the ball head is another locking knob that enhances the ability to tilt the ball-and-socket joint in a precise and level manner by restricting all other lateral movements. Finally, a dual-function knob below the rotational locking knob can be used to activate the ball head's ability to generate audible and tactile clicks at 15° intervals. Useful when capturing a sequence of images that are intended to be aligned and merged into a single panoramic photo, those clicks can be used to ensure that images within a sequence sufficiently overlap to form a panorama. The dual-function knob can also serve to quickly lock the head against its rotating base, so that when the ball head is turned, it can be screwed onto or unscrewed from a tripod or support system, rather than rotating in place. Box Dimensions (LxWxH) 25.0 x 5.2 x 5.1"